I dislike the idea of making two death-related postings in a single week, much less four. But alas, it is necessary to reflect on the news from Japan of Maestro Akira Ifukube's passing at the age of 91, from natural causes. With his grim, churning yet magisterial score for Ishiro Honda's Gojira [US: GODZILLA, KING OF THE MONSTERS!] in 1954, Akira Ifukube opened the door to a highly individual orchestral sound that would define the so-called kaiju eiga ("monster movies") of Toho Studios for more than half a century. 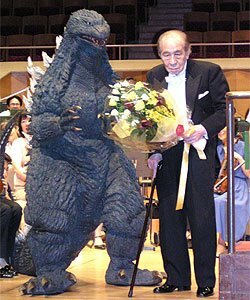 Ifukube would not score all of the Godzilla films produced during that time, but his spirit was always present and guiding in the works of his replacement composers, who knew all too well whose shoes they were being asked to fill. A Godzilla film would somehow be less than a Godzilla film if his appearances were not accompanied, at least once, by those musical passages familiar to all the series' followers -- the hulking main theme, the strident march accompanying scenes of mobilized military forces, and most of all, the music (proud, ascendant, yet rich in gravitas) that told us that Godzilla was, although bloodied, unbowed. It is true that Maestro Ifukube was sometimes criticized for leaning too heavily on these standards he had set, but it is also important to note that he continued to add scores of conspicuous significance to his backlog throughout the entire length of his career. Though KING KONG VS. GODZILLA was largely rescored with library music for its US release, the original version Kingukongu tai Gojira (1962) features one of his most ravishing scores, one that was faithful to the urban/jungle orchestral fusions of Max Steiner's seminal KING KONG score, while further fusing it with the lyricism of melodies evocative of the Pacific islands. This score was paid the ultimate compliment of being included in original Japanese release prints in full stereo. One of the greatest glories of Ifukube's catalogue, the heartbreakingly plaintive "Song for Mothra" sung by Imi and Yûmi Ito ("The Peanuts") in GODZILLA VS. THE THING [Mosura tai Gojira, 1963], was showcased in a passage of unexpected poignancy in the midst of what its young audience assumed would be little more than a knock-down, drag-out monsterfest. It was Ifukube's role as composer to keep the series' juvenile aspects rooted in emotion, wisdom and soul -- he infused scenes of war with the awareness of loss. Knowing his value to the series all too well, Toho acknowledged the 30th anniversary of the original film by producing a memorable home video exclusive in 1984: GODZILLA FANTASIA, a "greatest hits" compilation of series highlights accompanied by all-new stereo orchestrations conducted by Ifukube. In Japan, even in the laserdisc era, it was not uncommon for Ifukube's kaiju eiga to be released on disc with isolated music-and-effects channels. When Ifukube returned to the Godzilla series after a nearly 20 year absence in the 1990s, he added two more masterpieces to his canon with Gojira tai Mosura [GODZILLA VS. MOTHRA - THE BATTLE FOR EARTH, 1992] and his penultimate series score, Gojira tai Mekagojira [GODZILLA VS. MECHAGODZILLA II, 1993]. In addition to scoring these films, Ifukube was responsible for creating/recording the roars of the various Toho giants. Of course, Ifukube was not just about Godzilla. In addition to being an accomplished classical composer and conductor, he used his vast knowledge of medieval and ethnic Japanese music and instrumentation to score the DAIMAJIN and ZATOICHI film series for Daiei Studios, and incorporated all manner of bizarre and modernistic instrumentation (saws, theramin, electric guitar, Hammond organ) when scoring some of Toho's most impressive science fiction films, such as Chikyu Boeigun [THE MYSTERIANS, 1957], Uchu daisenso [BATTLE IN OUTER SPACE (1959), and Kaitei gunkan [ATRAGON, 1965]. Akira Ifukube retired two years ago, on the eve of his 90th year, so his admirers are at least saved the grief of a career interrupted or cut short. We have all the music he planned to give us, and we can rest confident that it will survive us all. Which means that all we recognize of ourselves in Ifukube's music -- our sometimes primitive emotions, our will to survive and triumph, and not least of all, our responsiveness to beauty and tenderness -- will live on, too.